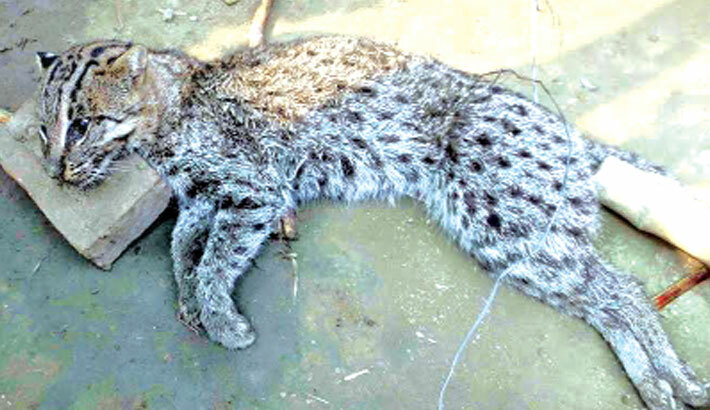 Fishing Cat is threatened in ..
On 3 December 2015, villagers killed a Fishing Cat in Narshatpur village of Naldanga upazila, Natore. On 2 January 2016, local people captured a Fishing Cat discovered in a barn. Two men were injured while trying to catch it. The fate of the cat remains unknown, it probably did not survive. 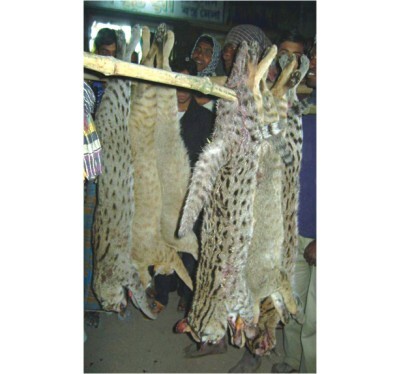 On 18 January 2016, two Fishing Cats were caught in Munshiganj and Rajshahi districts. 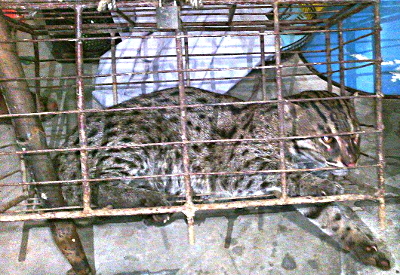 On 21 January 2016, a Fishing Cat was found inside a poultry farm and captured by local people. It was later handed over to the Livestock Department in a fatal condition and possibly did not survive. On 22 April 2016, a Fishing Cat was seen hunting a goat or a duck, and was killed by local people in Ghiba, Khulna District. On 27 May 2016, a local mob killed a Fishing Cat that was spotted in an abandoned house in Manikdogo Village. In August 2016, this Fishing Cat escaped death from monsoon floods and was killed by villagers in Manikganj District. This Fishing Cat had allegedly killed ducks at a local farm. It was trapped in a cage and wounded on 5 November 2016 and handed over to the Forest Department. On 7 November 2016, local people captured and possibly killed a Fishing Cat that allegedly had attacked several people near Auliapur. On 5 March 2017, local people captured a Fishing Cat in a paddy field using a long fishing net. They handed it over to the authority, but it possibly died. On 1 May 2017, villagers in Kushtia District bludgeoned a Fishing Cat to death with sticks and pipes and hanged it on a tree. 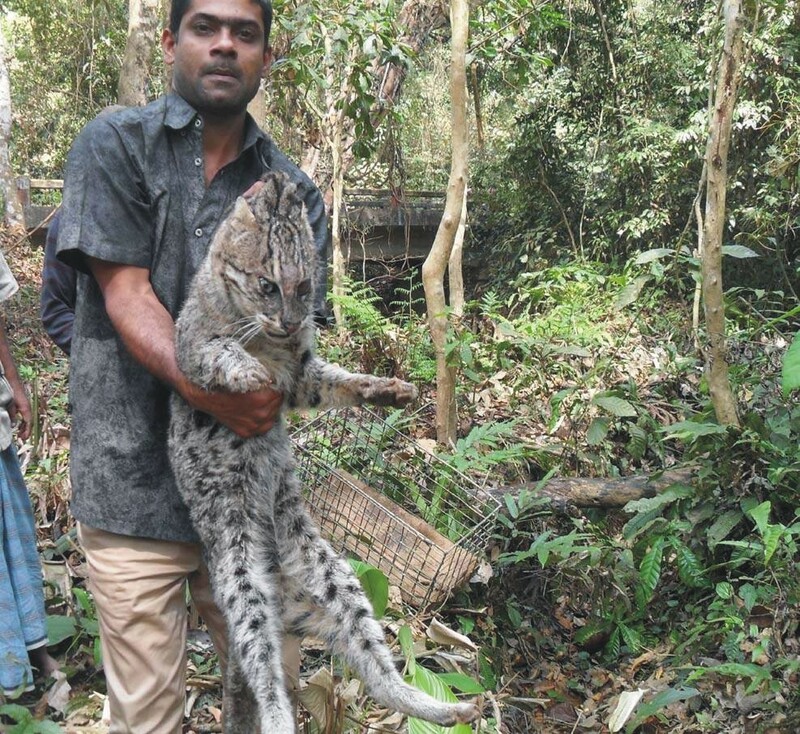 On 3 May 2017, a Fishing Cat was captured after it was spotted in a paddy field near Nishipur Mollahpara Village. It possibly did not survive. On 4 May 2017, a Fishing Cat was seen by locals near Goalfa Village, captured with a fishing net and beaten to death. On 21 September 2017, this Fishing Cat was captured by locals, rescued by conservationist friends in Moulvibazar, northeastern Bangladesh, and released to Lawachara National Park. 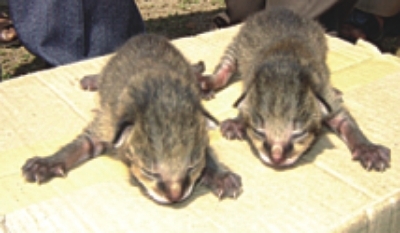 Fishing Cat cubs recovered in Panchagarh on 16 March 2006 died as the authorities did not take them into their custody. 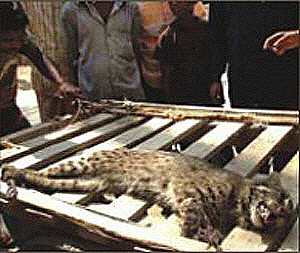 In April 2008, local people captured this Fishing Cat in Chapainawabganj. Police recovered the animal and handed it over to Rajshahi Zoo with the help of the forest department. 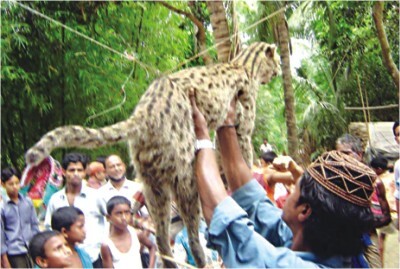 In January 2009, local people in Barisal captured and beat up this Fishing Cat Forest Department officials and police later rescued the animal, which was in a critical condition. 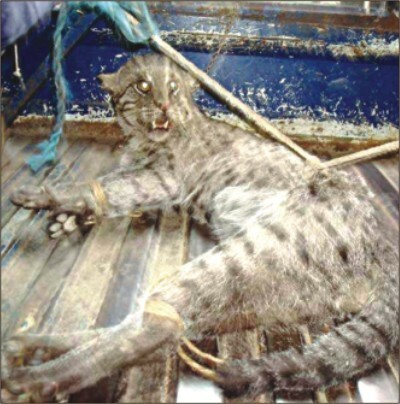 In February 2009, villagers beat a Fishing Cat to death in Barisal using rods and sticks. They dumped the body near a river. In March 2009, villagers in Natore beat a Fishing Cat to death after it had attacked a domestic animal in a neighbouring village. In March 2009, a Fishing Cat attacked a farmer in a paddy field. The farmer raised a hue and cry, other villagers rushed to the spot and beat the animal to death. A Fishing Cat escaped from Rajshahi Central Zoo in January 2010. Local people chased the cat along with their dog, which grabbed the cat's neck. The villagers beat the cat to death. 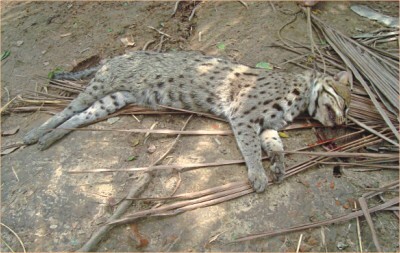 In April 2010, villagers killed a Fishing Cat in Manikganj with fishing spears. 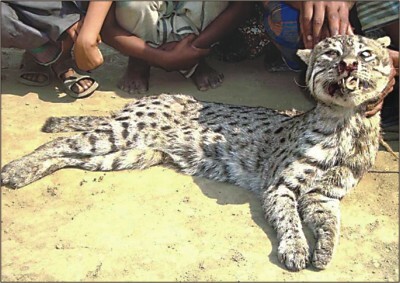 In May 2010, a farmer saw a Fishing Cat in his field in Kushtia. He called other villagers through his mobile phone who came with sticks and iron rods. Together, they encircled the field, caught the animal and killed it on the spot. In October 2010, local people searched a jungle near Kholapara in Singair Upazila of Manikganj violating laws. 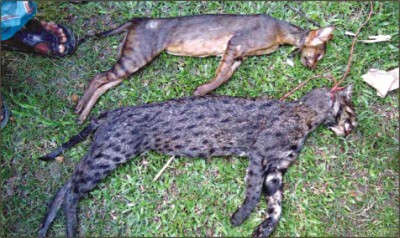 They found and beat to death a Fishing Cat and a Civet. 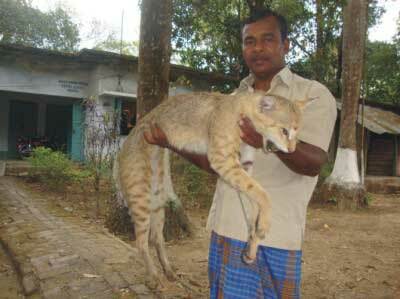 People of Balati village in Netrakona district caught this Fishing Cat in February 2011 and handed it over to the forest office. In March 2011, locals in Louhajang hit a Fishing Cat with a cleaver to death. Livestock officials tried to keep alive its three cubs. 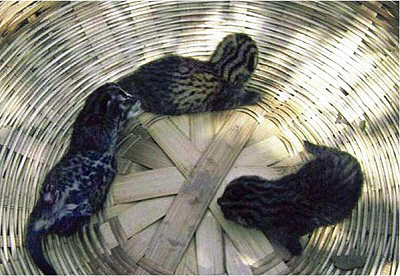 In early May 2011, villagers of Dhakdhol in Natore caught and strangled a Fishing Cat when it entered a local poultry farm. 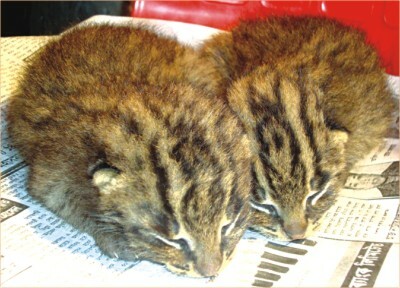 Two Fishing Cat cubs were rescued in Dhakdhol Dangapara village in Singra upazila of Natore on 12 May 2011. 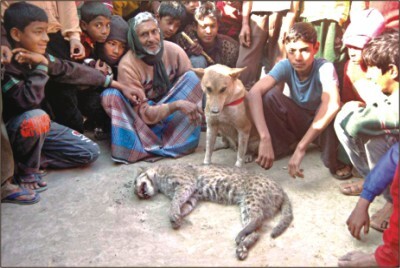 In February 2012, indigenous hunters from Rajshahi trapped and killed six Fishing Cats in Kushtia. 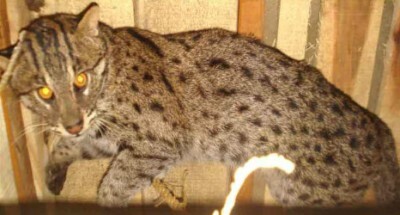 In March 2012, this Fishing Cat was caught by locals near Hakaluki Haor in Moulvibazar district and later released to Lawachhara National Park. 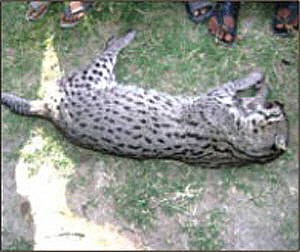 In April 2012, locals beat this Fishing Cat dead at Kalikagaon village in Sadar upazila of Thakurgaon. 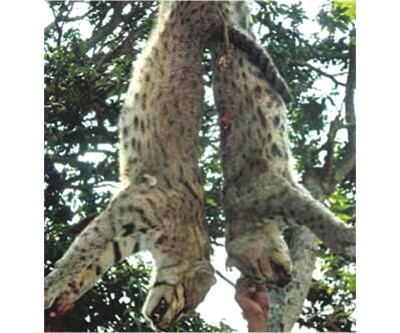 In May 2012, villagers in Belgachi killed and hanged two Fishing Cats.